Boom Street, an interactive board game for Wii, is due to release across Europe on January 6th, Nintendo have today announced. A seemingly similar concept to that of Monopoly, the game, which was announced at E3 2011, challenges players to get rich quicker than their opponents through acquiring and investing in properties as they traverse a variety of different themed boards. You’ll be able to either challenge up to three friends using the same Wii Remote or those across the world through utilising the Nintendo Wi-Fi Connection. Players may even engage in an in-game stock market element to purchase shares and earn dividends to increase your wealth. There are numerous ways to play, ranging from beginner settings to help newcomers learn the basics, to Standard Mode which offers deeper strategic options including the ability to manipulate the stock market. 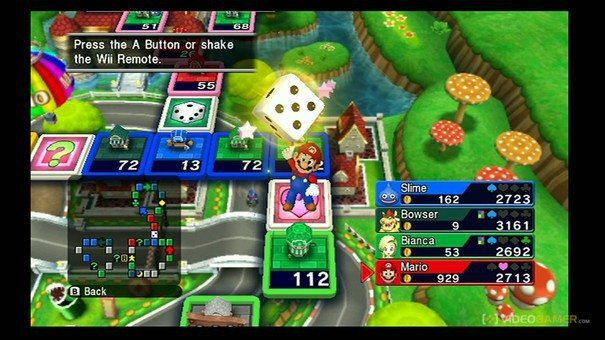 Themed boards take their inspiration from a variety of Mario and Dragon Quest locations, including Starship Mario from Super Mario Galaxy and Alltrades Abbey from Dragon Quest. Players may also choose to play as their Mii character, or from a selection of twenty playable characters from both Mario and Dragon Quest franchises, including Mario, Luigi, Bowser, Yoshi, Slime, Platypunk and Stella. Boom Street will release exclusively for Wii across Europe on January 6th.